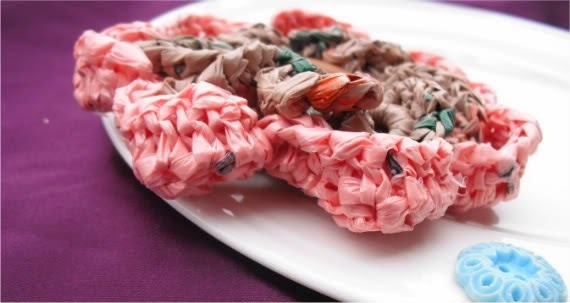 Scattered Scissors: How to Make Yarn from Plastic Bags - AKA PLARN!! Earth Day is almost here. 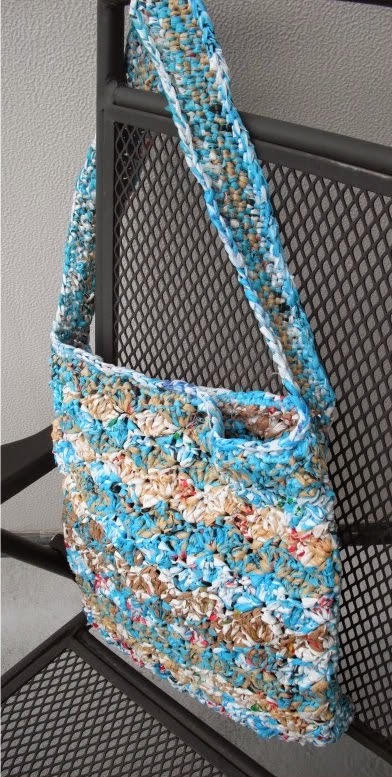 To celebrate I'm going to share with you how to make your own plastic bag yarn, otherwise known as PLARN. If you haven't tried this, I recommend doing it at least once. It's not for everyone but it's definitely Earth friendly and unique. It's also a great way to use up bags. You probably get at least a few dozen bags every week from grocery shopping. Do you throw them out or do you try to re use them? Plus did I mention it's FREE yarn. If you've ever made a large project you will appreciate this part. Yarn can be expensive!! If you don't know how to make plarn you are in luck. Just search YouTube or Google and you will be bombarded with at least a dozen videos. Don't get stressed out. There are two common ways to make it and 99.99% of the world makes them that way. To make a double ply of plarn loops are cut and join them together like HERE. To make a single ply of plarn one large strand is made by half cutting the bag like HERE. I am the other .01%. I prefer a different method of making my plarn. I feel like I can control the width and work around any imperfections in the bag this way. I call it the Bag Lady Technique. You will understand why later. 1. Grab a stack of clean plastic bags. Pick bags that do not have large rips or holes in them. 2. Tuck the gussets (side pockets) in to make the bag flat. Then cut the sealed part off with a nice pair of scissors. A good pair will glide smoothly across the plastic without having to open and close them several times. You will end up with a tube of plastic. This is what we want. 3. Sit down in a nice chair with your tube of plastic and scissors. Take your tube of plastic, slip it over both your legs and put it on with the freshly cut edge toward you. Expect to feel like a bag lady, you pretty much ARE wearing plastic bag right now. 4. Pull your legs apart to create some tension in the plastic tube (I know, I sound so UN-ladylike. I must be a hussy). Starting at the clean cut edge cut a small portion into the bag at an angle. For thin flimsy bags I make my strips wider so the yarn does not look bare. 5. Using your scissors spiral cut around the bag, sliding the bag around your legs as you go. If you really want a photo of my beat up legs, doing this. Let me know. I don't want to come off as a hussy. LOOOK. LOOOK at my legs. Isn't the sight of me wearing a plastic bag ssssseexy! Continue sliding and spiral cutting until you reach the top of the bag and run out of plastic. Cut off any hanging loops or parts of the handle that don't fit comfortably in your yarn. Now you have a single strand of plarn free of knots. 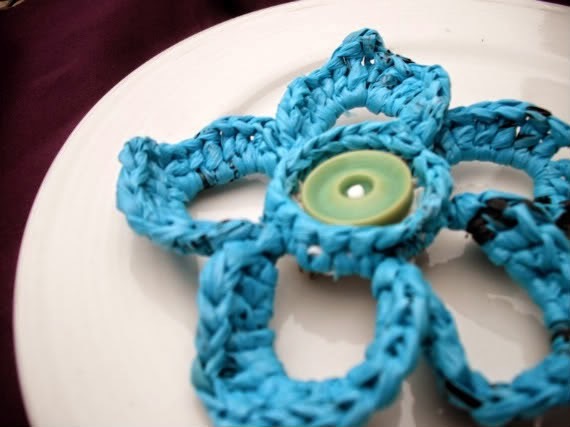 Just look at some of the things you can make with Plarn. Well, that I've made with plarn. 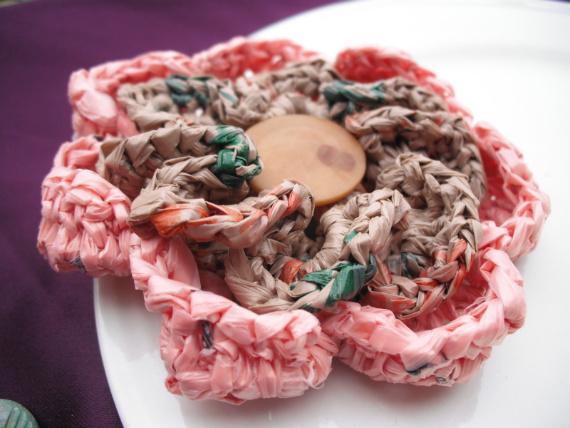 This is a brooch I made using tan and corral colored bags. 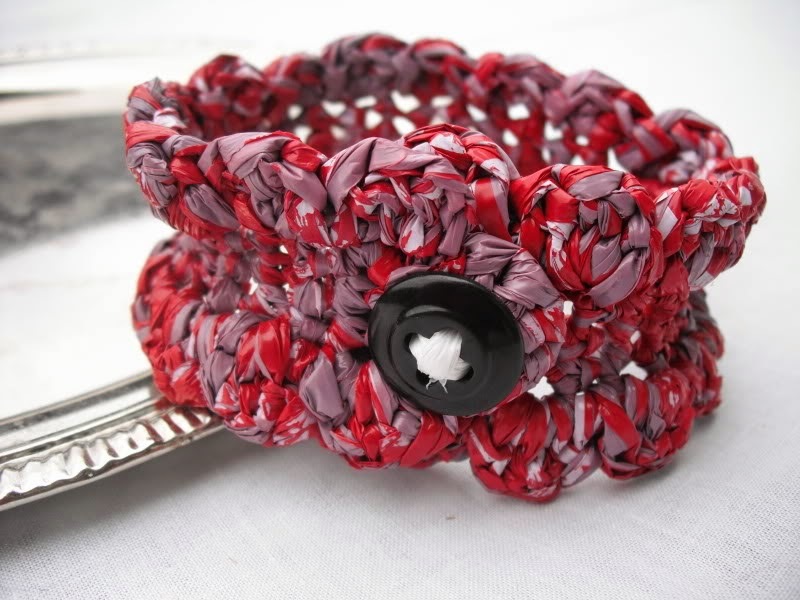 This bracelet was made using a bright red Target Holiday plastic bag. I love how it looks mauve in some places from the plastic twisting around. This clutch bag was made out of tan, blue and white bags. Two strands of plarn were used to make this. I just tied on another color when one bag ended to give it some continuity. The crochet pattern is an offset wave stitch from a sampler book. I think it was in this one. 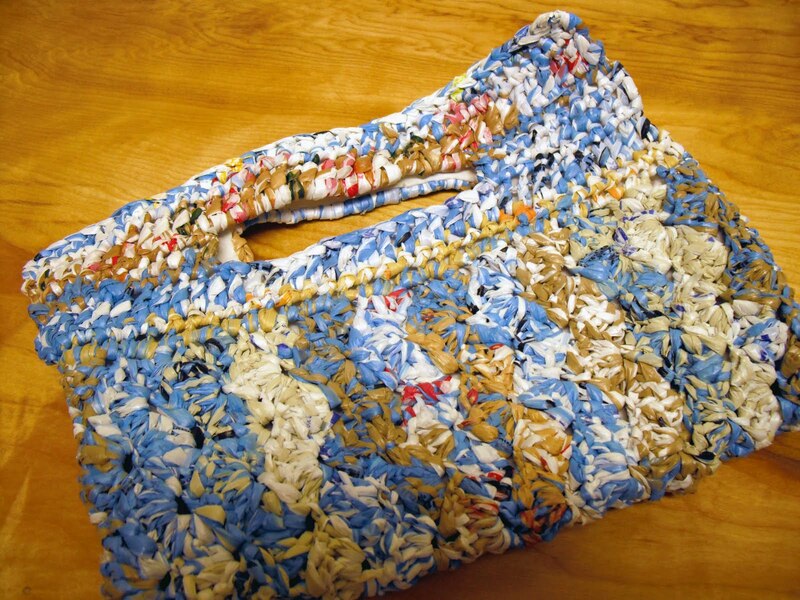 I have made a few carryall tote bags using the same stitch. All these little guys since this photo have been sewn onto some snap-clip style barrettes. 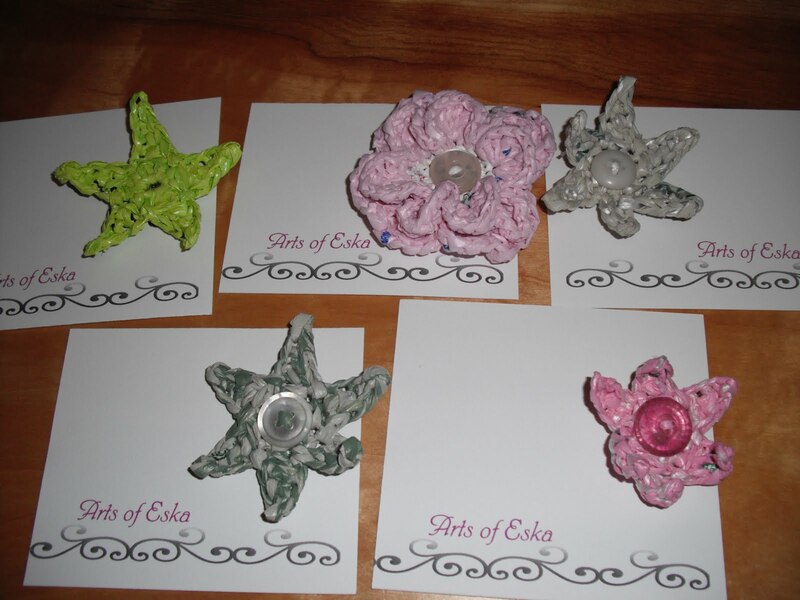 My daughter has grabbed several to go in her hair-tie drawer including the corral flower. 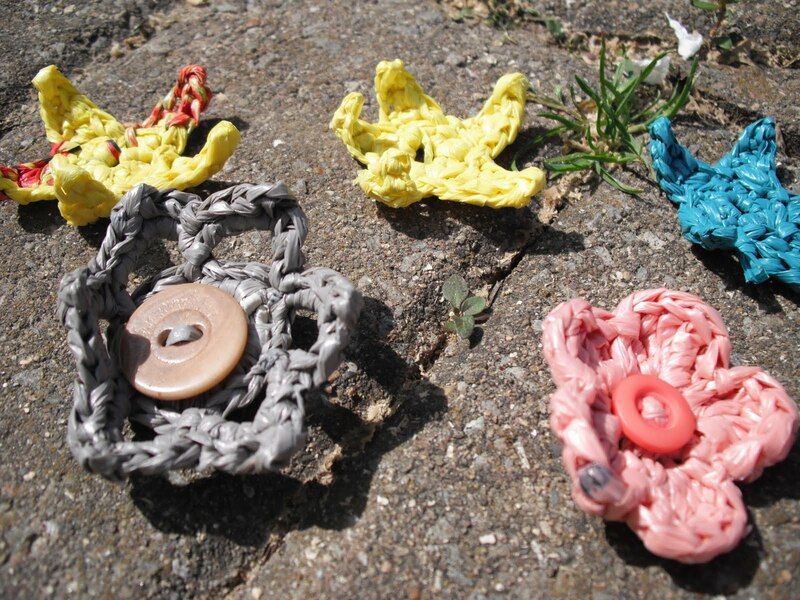 You can make all kinds of things with plarn. As a safety precaution I advise to not use it for anything near your face/neck as it is plastic and does not breathe. Tip: When you run out of one bag's worth of yarn, always tie on the next. I find that just looping it does not secure it enough. The plastic can be slippery. Go forth and make plarn my minions. And if it doesn't work for you, drop it off in the recycle bin on the way to the pastry shop.